Phision Therapeutics, an early-stage life sciences venture, has won University College Dublin’s (UCD) 2015 Start-Up Award after being declared overall winner of this year’s UCD VentureLaunch Accelerator Programme. The new venture is developing proprietary therapeutic drugs to more effectively treat vision loss to prevent blindness associated with ageing or diabetes. The retinal disease age-related macular degeneration (AMD) is a leading cause of vision loss in Western societies. In the US alone the retinal therapeutic market, to treat such diseases, is valued at $3.5 billion annually. The current treatment for patients experiencing vision loss due to AMD involves up to 12 eye injections per year. It is recognised that patients are also at risk of eye infections or retinal detachments due to the injections. In addition up to 30% of AMD patients do not respond to these injections, and for them there is currently no effective alternative treatment. To address such issues and using an unbiased, systems-pharmacology approach Phision Therapeutics has identified, and is developing, novel small molecule drugs with novel mechanisms of action to curb the undesired growth of ‘leaky’ new blood vessels in the eye which lead to vision loss and blindness. Phision Therapeutics is a new venture emerging from research carried out over several years by founder Dr Breandán Kennedy with Dr Alison Reynolds at the UCD School of Biomolecular and Biomedical Science and the UCD Conway Institute. Funders of this research to date include; Enterprise Ireland; Science Foundation Ireland; Irish Research Council; Health Research Board and the European Commission’s Marie Sk?odowska-Curie Actions Programme. The overall objective of the UCD VentureLaunch Accelerator Programme is to support the creation, and to accelerate the launch, of sustainable and profitable new ventures based on intellectual property emerging from UCD. The programme aims is to equip UCD researchers with the knowledge, skills and understanding that is required to work as part of a team successfully leading a new commercial venture. In addition to the 2015 UCD VentureLaunch Accelerator Award, Phision Therapeutics was presented with a cheque for €10,000, and a professional services package to the value of €15,000. The prizes are sponsored by AIB, Bryan Maguire Business Consulting, Deloitte, and NovaUCD. 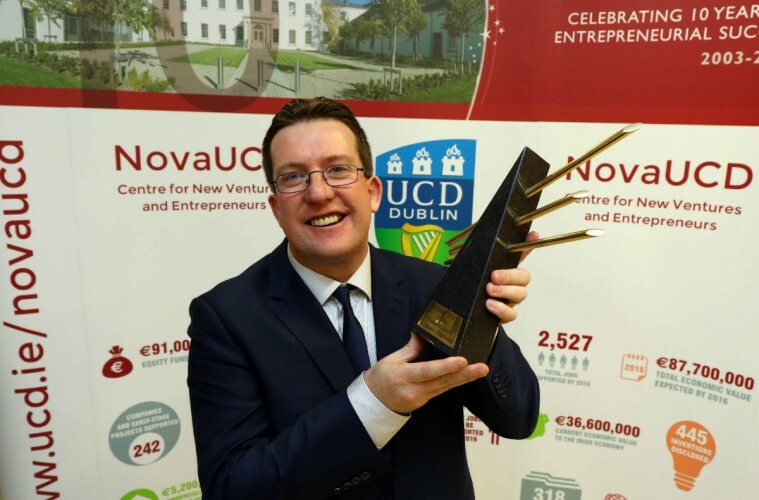 The 2015 UCD VentureLaunch Accelerator Programme evaluation panel, which selected the overall winner, was chaired by Brendan Cremen, UCD Director of Enterprise and Commercialisation. The other members of the panel were Dr Sharon O’Kane and Dr Sean Baker, NovaUCD Entrepreneurs in Residence in Life Sciences and ICT respectively; Dr Helen McBreen, Investment Director at Atlantic Bridge Capital and Dr Edward McDonnell, Director, CeADAR, the Centre for Applied Data Analytics Research.